Despite being part of one of the 7th largest furniture manufacturing companies in the world, Progressive still considers themselves a family. In fact, it is one of the attributes that they are the most proud of – continuing to be a family centered View more business built on value and quality for the consumer. They know how expensive it can be to furnish your home and they know the kind of lack luster choices that are out there. Their mission for over thirty years has been to outfit every American family with the kind of durable, stylish furniture that truly makes a house feel like a home. Despite being part of one of the 7th largest furniture manufacturing companies in the world, Progressive still considers themselves a family. In fact, View more it is one of the attributes that they are the most proud of – continuing to be a family centered business built on value and quality for the consumer. 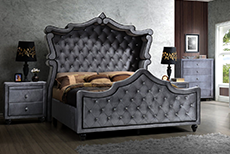 They know how expensive it can be to furnish your home and they know the kind of lack luster choices that are out there. Their mission for over thirty years has been to outfit every American family with the kind of durable, stylish furniture that truly makes a house feel like a home.